These beautiful cuff links are just the thing to give as a gift to that someone that likes a bit of understated fashion to make their dress shirt or other piece of clothing look that much better. They're made from stainless steel so they're built to last, with a brushed finish to give that little bit of texture and design without being too overbearing. Adding to the texture and pattern is the centerpiece of each of the cuffs, a square of black, carbon fiber material. Putting these all together, this is the choice you want to make for simplistic elegance if plain cuff links just aren't enough to convey what you want for yourself or your gift. 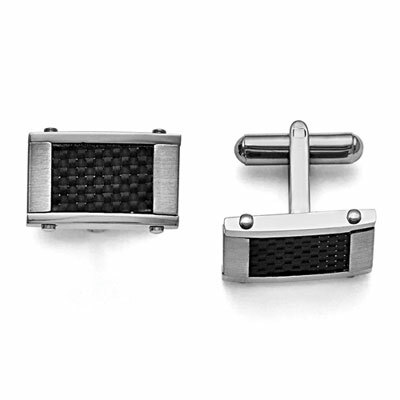 These stainless steel cufflinks feature a black carbon fiber inlay with a brushed finish base and rivet detail. Cuff links measure 18mm (11/16") x 11mm (7/16"). We guarantee our Carbon Fiber and Stainless Steel Cuff Links to be high quality, authentic jewelry, as described above.